The Cure's first release in North America. Released in February 1980, this album combines several tracks from the band's May 1979 debut album Three Imaginary Boys (which was not released in the US at the time) with new material from the 1978-1979 era. Do not confuse with this debut album: even though this issue features many songs from that album, they are different records with divergent track lists. Four tracks from "Three Imaginary Boys" were omitted: "Foxy Lady", "Meathook", "So What?" and "It's Not You" (plus the hidden track "The Weedy Burton"). They were replaced by excerpts from the first three singles : "Killing An Arab", "Boys Don't Cry" (+ B-side "Plastic Passion") and "Jumping Someone Else's Train". "I'm Cold", B-side to "Jumping Someone Else's Train", was not included, replaced by "World War", an outtake from the Three Imaginary Boys recording session #2 recorded at Morgan Studios on October 12th, 1978. In 1980, it was released only in US, Canada, Australia and Germany. The first UK release took place in 1983. It has since been reissued many times in different formats and with slightly different track listings. 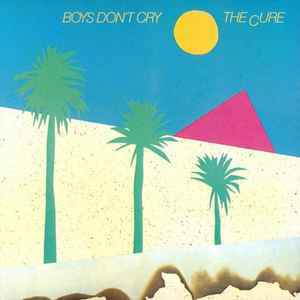 All the reissues feature "Boys Don't Cry" as opening track. The design of the cover is an excerpt from the back cover of Three Imaginary Boys LP, formerly used to illustrate the song "Fire In Cairo". This is an improved version of the UK début; most of the tracks are the same, but the new additions "Plastic Passion", "Killing an Arab" and "Jumping Someone Else's Train" are better than the tracks they replaced, and “Boys Don’t Cry is one of their best ever tunes but most of the leftover material from their début that appears here is still a bit weak. Favorite Cure album by a mile. Quintessential post-punk.